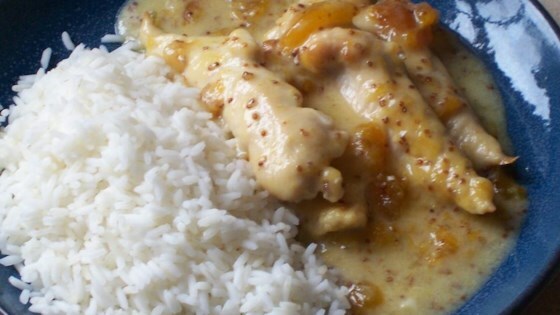 "This is a creamy Southern style apricot chicken recipe that the entire family will love. Make it for guests and they will never know how easy it was! Serve with rice Pilaf." Preheat the oven to 350 degrees F (175 degrees C). Arrange the chicken pieces in a single layer in the bottom of a 9x13 inch baking dish. Bake uncovered for 25 to 30 minutes, or until no longer pink in the center, and juices run clear. While the chicken is cooking, stir together the apricot preserves, sour cream, mustard, salt and pepper in a small bowl. When the chicken is done, remove from the oven, and coat with the sauce. Return to the oven for 10 to 12 minutes, or until sauce is bubbly and hot. It was good! My kids liked it. I made this super quickly by browning cubed raw chicken in a skillet and then pouring the sauce over it and simmering for 10 minutes. Thank you! I loved this recipe - easy and tasty but I think the portion sizes are a bit optimistic. I'd say this was for 6/4 people depending on how hungry they are. This tasted nice & was easy to make but the sauce was a little too rich for our liking. Even using no sugar apricot preserve and fat free sour cream, this was a bit too sweet for our liking. It was very easy to make, but I doubt it will make the regular rotation. I must admit that I was worried about the sour cream w/ preserves, but it really have a great flavor when it was done. I will make this again. I did like this recipe... Easy and Delicious..